PSI Biological Safety Cabinets, enclosed containers and other engineering controls designed to remove hazardous biological materials. 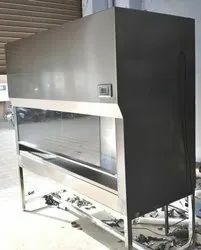 The biological safety cabinet is the principal device used to provide containment of infectious splashes or aerosols generated by many microbiological procedures. Biosafety Cabinets provides an absolute level of safety, which cannot be attained with Class I and Class II cabinets. All Class III cabinets are usually of welded metal construction and are designed to be gas tight. Work is performed through glove ports in the front of the cabinet. During routine operation, negative pressure relative to the ambient environment is maintained within the cabinet. This provides an additional fail-safe mechanism in case physical containment is compromised. On all Class III cabinets, a supply of HEPA filtered air provides product protection and prevents cross-contamination of samples. Exhaust air is usually HEPA filtered and incinerated. Alternatively, double HEPA filtration with two filters in series may be utilized. Materials are transferred into the cabinet using a pass-through unit installed at the side of the work area. Class III cabinets usually exhaust air back to the laboratory; however, air may also be exhausted via a dedicated system to the external environment. When a dedicated system is employed, they are also suitable for work employing toxic chemicals as an adjunct to microbiological processes. All Class III biological safety cabinets are suitable for work with microbiological agents assigned to bio safety levels 1, 2, 3 and 4. They are frequently specified for work involving the most lethal biological hazards. 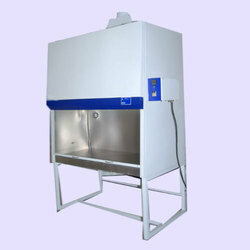 We are offering Laboratory Biosafety Cabinets to our Clients.